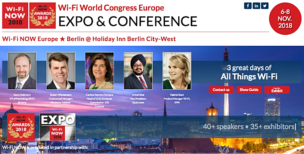 Wi-Fi NOW Europe: ‘Ich bin ein Berliner’ – and so can you! For the first time ever a major Wi-Fi industry event is going to Germany! We will be right in the heart of the EU’s biggest market for THREE DAYS this November – so if you’re working with Wi-Fi now is the time to get your ticket or contact us to reserve your expo space. European Commission (EC), Wi-Fi Alliance, Telenet, Deutsche Telekom, KPN, Waoo!, YouSee, Cisco, VAST, IgniteNet, Eurona, Qualcomm, Cambium Networks, Celeno, Quantenna, ARRIS, Dimension Data, Cisco, Ruckus Networks, Encapto, F-Secure, Adant, Komodo Systems, Qorvo, Sivers IMA – and many, many more!